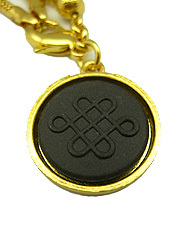 Empowering the amulet are two authentic "Quiren Incantations" of the Taoist Sect, providing a special channel to the cosmic realm to invoke divine help from the 5 Quiren Deities. Also featured on the amulet is the emblem of a smooth-sailing Wealth Ship that will symbolically smoothen your financial and career paths ahead. Why is the benefactor's luck a priority? 1. If your interaction with colleagues at work or social life suddenly go wrong or if you suddenly experience a series of quarrels, hostility, confrontation and arguments in friendships, you may be afflicted with certain negative energy that is tarnishing your benefactor's luck. 2. If there is tension within the home, especially when members of a house don't get along very well, leading to relationship issues, you may be affected with negativities that shut your benefactors luck. Even if you don't quarrel much, but your life is unhappy because there is so much hatred among members of the family. 3. If there is lawsuit and gossip about you in your personal life or at work, which could potentially lead you to legal entanglement and battle, you may be having your benefactor's luck afflicted. 4. If you are the victim of jealousy and politicking at work or in your neighbourhood. Sometimes even your close friends gets jealous of you because of your increase in financial existance, promotion, good life or wealth. People get jealous to the extent that they backstab your back and play tricks to harm and make you lose. These can come from your jealous colleagues, spurned lovers, envious friends and business enemies. 2. Dissolving tension and anger. 3. Victim of gossip in the office or neighbourhood. 4. Victim of jealousy and politics. 1. To ensure a smooth-sailing career without bad politics, display the amulet at your work desk. 2. To ensure you earn money easily, display the amulet at your sheng chi direction, SE universal wealth corner and water star-8 location in your home or workplace.